Ruler of the Kingdom of Bonny, an independent trading state on the Niger Delta, now part of Nigeria. LS. 1p and integral blank leaf. 13 Philip Terrace, Tottenham, N. 13th July 1857. To Richard C[ooke] Coles, Esq. "My Dear Friend, I again take the liberty of troubling you with 3 copies of documents in support of my cases for your kind perusal and advice to me thereon. I remain, my dear friend, G. Pepple." 8vo. Approx 7.25 x 4.5 inches. Backed onto paper by integral blank leaf with old mounting traces to verso of blank, else fine. Bonny, or Bonny Town, was an ancient independent state on the Niger Delta. It had been important as a slave trading state and, after 1806, it had turned to the trading of palm-oil and other commodities. The Pepple family had been the hereditary rulers for many years but in 1854 King William Pepple was deposed by the British and sent into exile in Britain with his infant son, Prince George Oruigbiji Pepple. The young George Pepple was educated in England at a private school in Bexley. During the period of exile Bonny was torn by bitter rivalries between two opposing factions of the family - the Manilla Pepple faction, led by Chief Oko Jumbo and the Annie Pepple faction led by Chief Jubo Jabogha (known as Ja Ja). The British restored William Pepple to the throne of Bonny in 1861 and he ruled until his death in 1866. He was succeeded by George Pepple who, having been converted to Christianity whilst at school in England, outlawed tribal religions and the worshipping of the iguana. Tensions between the two factions revived and turned into all-out war. At one point, George Pepple is said to have restored temporary order by roaming Bonny with a pistol and threatening to personally shoot the ring-leaders. The war threatened the palm-oil trade and peace was eventually restored by the intervention of the British who sent a gun-boat up the Niger Delta. However, George Pepple's friendship with the British led to him being deposed by his own people, led by Oko Jumbo, who declared himself king. In February 1886 a protectorate treaty was concluded and a ruling council was set up. George Pepple was restored and Oko Jumbo was publically degraded and his bans on Christianity were repealed. King George Pepple died in October 1888. If the date of his birth is correct (the dates of African kings are not always accurate) this letter was written when George Pepple was aged about 8. At this time he had been in exile with his father for 3 years and was attending an English school. 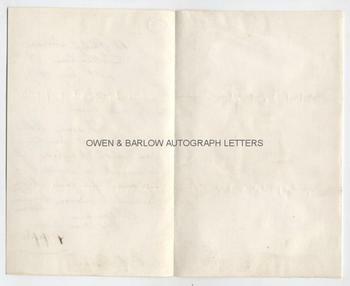 The letter is signed by him in a childish hand but the text is in a secretarial hand. 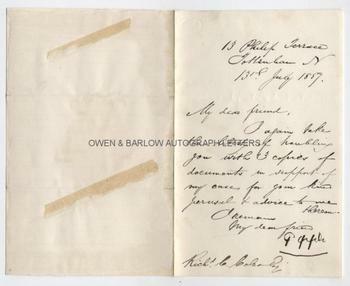 He is probably writing on behalf of his father and the three documents referred to are probably part of the family's petition to the British government for William Pepple to be restored to the throne (no doubt dependent upon the concluding of promises and trade agreements favouring the British). Richard Cooke Coles appears to be acting as some sort of emissary between the two. 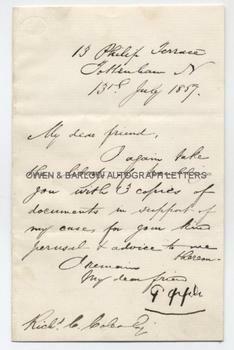 Letters of George Pepple are exceedingly rare. From a 19th century family album compiled by Gladys Margaret Coles, daughter of East India merchant Frederick W. Coles. Frederick Coles was the son of Richard Cooke Coles (1812-1888), the addressee of this letter, who was an East India Company trader and his wife, Elizabeth Regina Kreett, only daughter of Christopher Kreett, a British diplomat and Consul-General.